After travelling so much; living in different countries; having a relaxed outlook on what we call ‘home’ we provoke baffled reactions from some of our friends. ‘Twenty-three different houses. Which have you liked best’ I was asked recently. Hmm! In fairness, it wasn’t hard to answer. We’ve laid our respective hats in some spectacular settings, but one stands out. We only stayed a year, had no visitors and, apart from a trip into town every month to buy supplies, never saw another human in the entire period. Which wouldn’t suit everyone and I appreciate that! La Bergerie was a very special place. 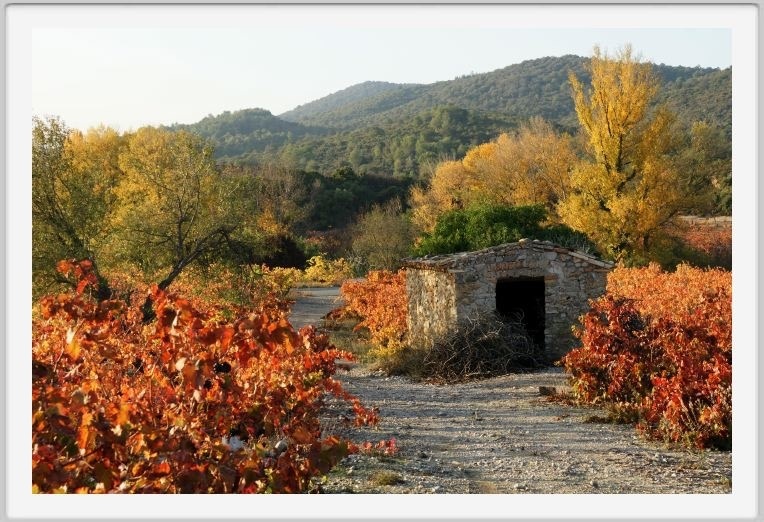 The Corbieres region – popularly known as Cathar Country – has an enchantment all of its own. I love the wine, the herbs, the encircling hills and the magnificent perched castles. Visiting, as a tourist, was one thing; buying a house here was quite different. You see, we’d decided we wanted something quite specific. A renovation project, with good potential for resale, in an isolated position with views. No, not just views: spectacular views. One day, we found it. The estate agent drew me a map, told me where to find the key and went to lunch. It was noon and lunch over-rides everything else in France. He’d flatly refused to accompany us as the journey was long and difficult, the house had been for sale for two years and he had better things to do. Such as eating lunch. We left the small town and headed into the hills, not realising that we were leaving behind the last vestiges of civilisation as we crossed the river. Twenty miles of twisting, mountainous roads with precipitous drops on one side and two hours later I parked the car under a chestnut tree. The hand-drawn map said we’d arrived, but we’d not seen a house, or a person, since we’d left the estate agent’s office. ‘Well, it well should be here, right here in fact,’ I snapped as Marigold did that annoying thing she does of looking around with an air of innocent expectation. I climbed out of the car and gazed around. It was hot and the earth beneath my feet was baking. I walked just a few paces past the tree and an incredible vista was revealed. Below my vantage point the land fell away and I could see all the way to the distant Mediterranean over a deeply wooded valley. No roofs, no television aerials, no satellite dishes. Nothing to see but nature in the raw. Marigold joined me. Neither of us spoke, but her hands gripped my arm tightly. Behind us a rough track meandered up the steep slope of the hill. Huge stones dotted the hillside and one of the larger stones caught my attention. My wife joined me and we walked up to a low, single-storey house with tiny windows and a vast terrace. Invisible from the road as it was built of the same red stone as the surrounding hillside, it was a Bergerie: originally built to provide shelter for a shepherd and his flock of goats. Standing on the terrace was the most peaceful place on earth. The pulsating heat emphasised the stillness. It wasn’t silent – not with the shrill chirruping of unseen cicadas and exotically scented wild thyme crunching underfoot – but it had utter serenity. I dragged a large flat stone to one side and found the promised key. Massive and ancient, it was a perfect match for the solid door, bleached of any discernible colour. It creaked open and we stepped inside. The back wall was solid stone as the house was built directly into the hillside; a craggy surface of reddish hues and irregular facets it was magnificently simple. The building couldn’t have been more basic. One large room with two tiny windows behind slatted shutters. A true blank canvas. Large enough to create a kitchen, bathroom, living room and bedroom, given a little ingenuity and a capacity for hard work. Assets we possessed in abundance. We walked round, went outside again, looked down the valley. Neither of us had spoken. We’re both talkers as a rule, but this situation didn’t require speech. The following day, we came back. By now I’d spoken at length to the estate agent and, briefly, to the owner. The owner wanted to get rid of an unwanted inheritance and wasn’t interested in protracted negotiations. I agreed a price, shook hands and it was sealed. In rural France, a handshake is sufficient. We made a visit to the local Notaire, signed a few papers and arranged a payment method. No survey. No inspection. No valuation. All sorted. On the day. The position was magnificent; the potential immense, but there were obvious problems. A minimum of fifteen miles in any direction from the nearest neighbour for a start. No electricity. No mains water. No sewage facilities. We would have to learn how to live in a mediaeval fashion. For rebuilding, I’d need electricity. A generator would power a cement mixer, drills, whatever else I would need and, long-term, I’d look into wind power, solar power, all common enough nowadays but a complicated research project back in those pre-Internet times. Water was less of a problem. The owner told me of a well further along the track which he claimed had been excavated in Roman times but remained viable after two thousand years. I found the well and it was exactly as he’d described. Five hundred yards along the track, in a cave, it was a runoff from the towering hills above the house and the main basin had been carved from the rock by hand. It was brimming with cool, fresh water from a natural spring and extending a water supply to the house would be comparatively easy. We moved in within the month. Apart from tools, books and a few clothes, we brought nothing with us. Work was back-breakingly hard, from dawn until it was too dark to continue. We cooked on an open fire, read by candlelight and slept on a mattress on the floor. It was the happiest time of my life and we’d never felt so close. While we worked, sitting on the roof, laying tiles, we were communing with nature. Eagles soared overhead, snakes slithered across the terrace, lizards scurried up the walls and every other day a family of wild boar came to visit as if checking on our progress. Not every day. Every other day. We didn’t bother about checking the time. We got up when it was light. Ate when we were hungry. Showered every night by candlelight under the leaky bucket contraption I’d made for the purpose using water from black plastic sacks laid on the terrace every morning to heat up in the sun and thus provide basic creature comforts. Eventually, we had a house capable of occupation by normal people. A kitchen in the style rustique led into a sitting room with a new window facing straight down the valley to the sea. Beyond were a cosy bedroom and a bathroom with a water supply on tap set out as a wet room, many years before the term became fashionable. A laboriously constructed fosse septique below the terrace contained waste water. Gas boilers, using bottled gas, allowed for the luxury of hot water, even on dull days. La Bergerie was the forerunner of ‘shabby chic’ and when the renovations were almost complete I took photographs, wrote a sales brochure and booked an advert in the Daily Telegraph. We wanted to move on. Do something different. Living here had been fantastic and we’d, deliberately, not shared it with anyone else. No friends or family had ever visited or even knew about it. This was our special place and would remain so. The Internet was still years away in the future, the only estate agent within twenty miles would never bring a client here, so we decided we’d sell it ourselves. The advert brought over a hundred replies and I sent out ninety-two colour brochures. Nothing fancy. Photographs and descriptions, printed on ordinary A4 paper at the library, folded over et voila, une brochure! Less than a year after we bought La Bergerie, we sold it again. For three times the price! Not bad, but the true value lay in the memories we retained. We’ve owned many houses, lived in different countries, but La Bergerie was special. We always knew our stay would be brief. To stay longer would risk familiarity. The day would inevitably dawn that we’d walk onto the terrace and not even bother to look down the valley to the sea. We’d take it for granted. Neither of us wanted to risk that. Years later, we often speak of that year of unrelenting labour in the most perfect spot either of us may ever see. We loved every moment and writing this piece now has made the hairs on the back of my neck stand up. Like Edith Piaf, Je ne regrette rien. Not at all. We’ve travelled far and wide since we left there. Seen so much. Met so many wonderful people. Yet we’ll never forget that year when it was just the two of us. 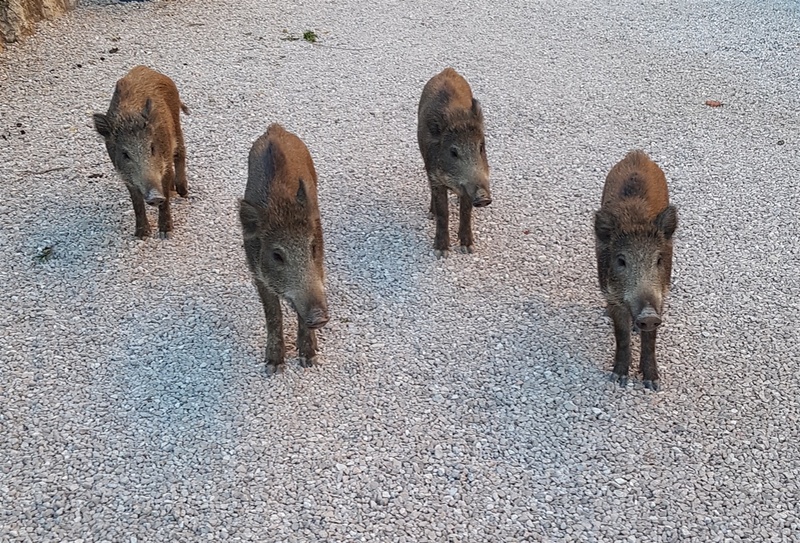 Well, just us and the wild boar. These are just babies. I don't stand this close to the big lads.